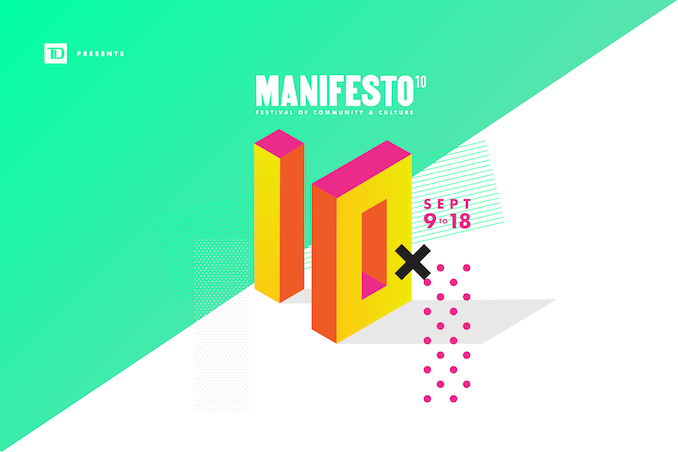 There are more than 10 reasons to put the MANIFESTO Festival (MNFSTO10) on your list of things to do this September. MNFSTO10 is a ten day celebration that brings a stellar line up of inspiring voices in arts and culture as well as those in our city’s diverse communities. From September 9 to 18, 2016 there will be parties, art installations, films, and much more. Opening night party will be hosted by Rich Kidd on September 9 with art installations and dance crews. DJs Sopie Jones, JAYEMKAYEM and Boi-1da will also be there. On September 11 MNFSTO10 will break bread after an opening weekend with A Brunch Ting at Thoroughbred Food & Drink with music by vintage vinyl podcast Cratery. MNFSTO10 x TIFF will present screenings of KiDULTHOOD and AdULTHOOD, the first two films of Noel Clarke’s British crime-drama trilogy, on Monday, September 12 and Tuesday, September 13 at Innis Town Hall. Director-writer-star Noel Clarke will be in attendance of the AdULTHOOD presentation to participate in an audience discussion following the screening. BrOTHERHOOD, the final film of the trilogy, will have it’s International Premiere at TIFF 2016. MANIFESTO x Da Degrees present the homecoming concert of Big Lean on Thursday, September 15 at The Mod Club. Big Lean has been making a name for himself in hip hop for the past six years and will make his Toronto performance debut with Murda Beatz, Jay Whiss and more. On Friday, September 16th, MNFSTO10 and Red Bull Sound Select are bringing BJ The Chicago Kid along with local stars a l l i e and Adria Kain to Adelaide Hall. MNFSTO10 and RapSeason’s presentation with Anderson .Paak & The Free Nationals, Kaytranada, Daniel Caesar and more at TD Echo Beach on Saturday, September 17. 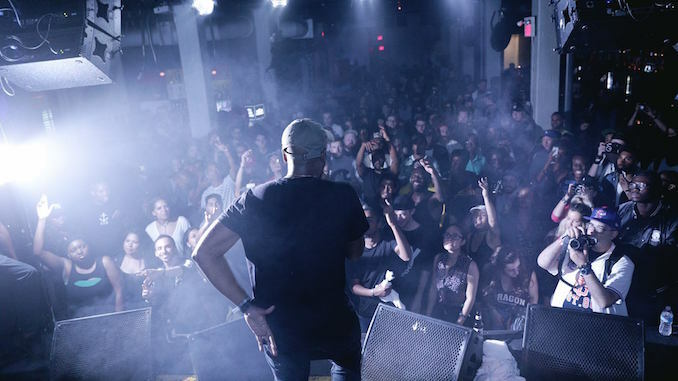 The official after party is the sixth edition of Manifesto’s legendary monthly party High Power – a sweet, sweaty celebration of dancehall, soca and reggae with DJs Nino Brown, Dre Ngozi, and special guests at Miss Thing’s. 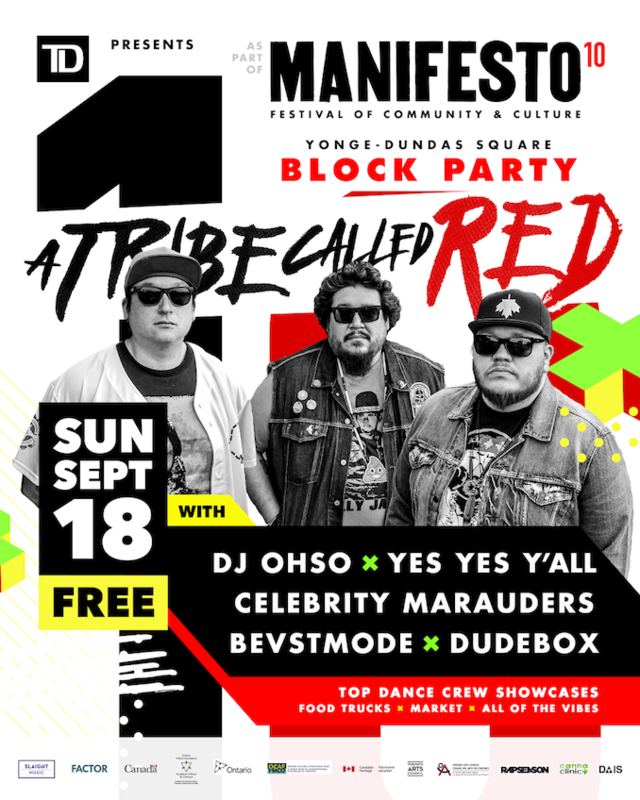 MNFSTO10 will end with a massive, FREE and family friendly block party at Yonge-Dundas Square on Sunday, September 18 with headliners A Tribe Called Red and DJ sets throughout the day by DJ OHSO, Celebrity Marauders, YES YES Y’ALL, BEVSTMODE, and DUDEBOX. The MNFSTO10 block party will feature multiple stages on all sides of the Square, top dance crew showcases, live art activations, a community market and tons of food vendors. Manifesto will hold a Summit with town hall meetings, workshops and keynotes to give their community a space to voice their hopes, frustrations, and ideas for positive change. From September 10 – 14 at various venues MNFSTO10 will host keynotes with writer and activist Desmond Cole; Q&As with fashion model Stacey McKenzie and filmmaker Director X; a live podcast recording by GYALCAST featuring Ponytailz; panels including Walk Like A Champion: Young & Queer in the Dance, and Roxanne’s Revenge: A Candid Discussion about Women in the Media; and professional workshops teaching tools from finances to online marketing.